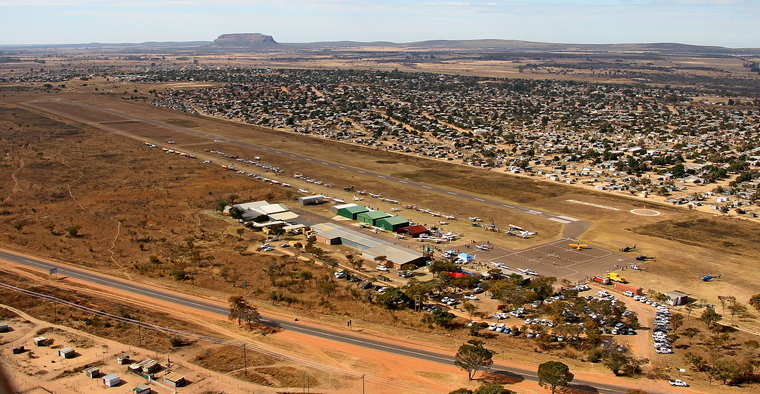 Nine years ago the first fly-in was held at Nylstroom and about twenty aircraft attended. 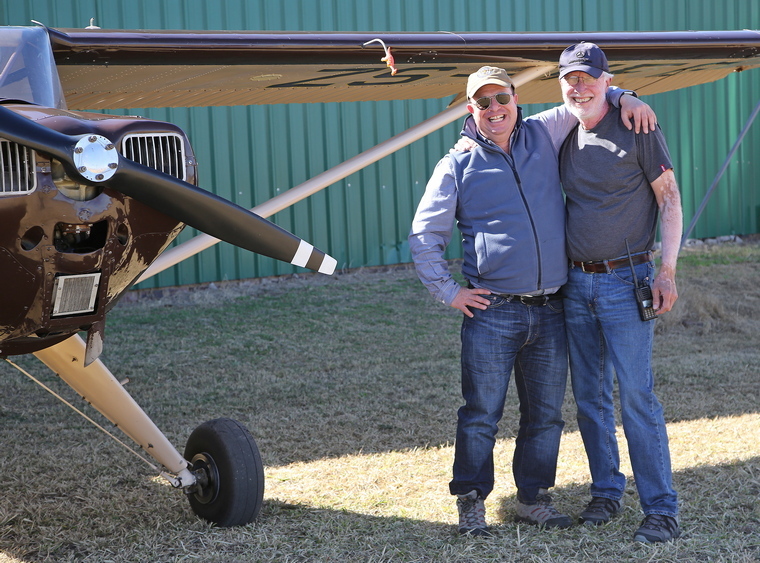 The following year the idea of a fly in for taildraggers was born and the event has grown considerably since its humble beginnings. 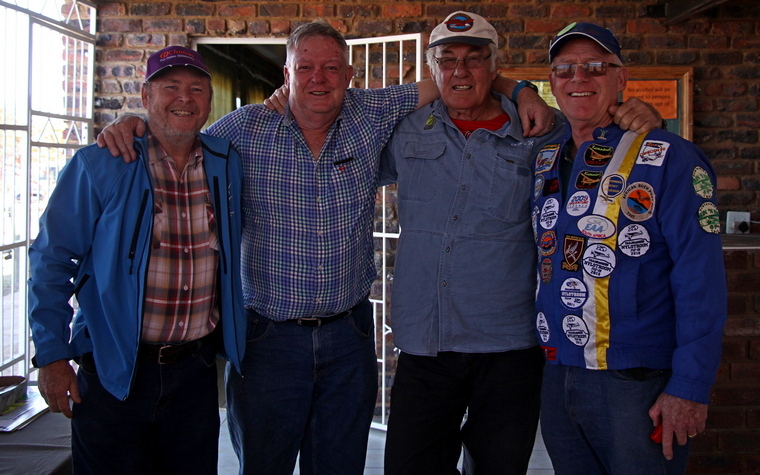 Next year will be the tenth anniversary of Taildraggers at Nylstroom and the fly-in is now firmly established on the calendar as the one event not to be missed. 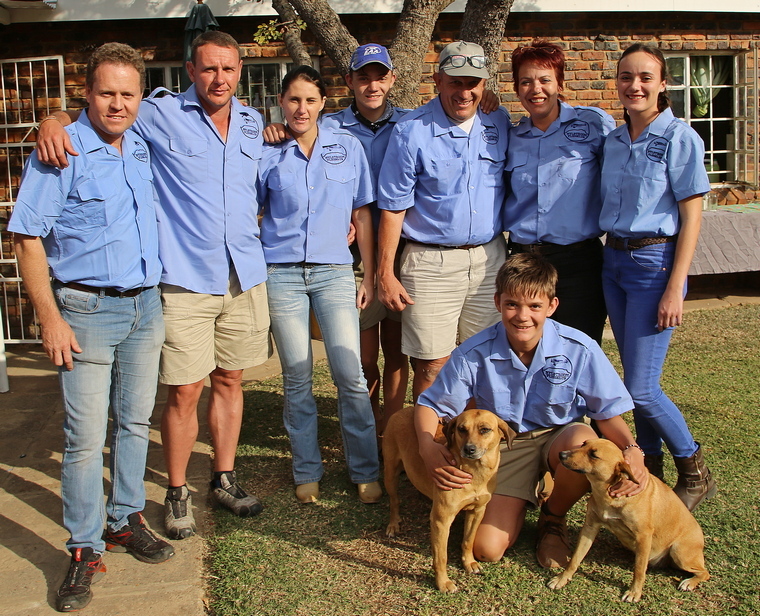 From left to right: Christo Bredenkamp, Jaco Smit, Melissa Mostert, Richard Nicholson Jnr and Richard Snr, wife Mariette daughter Tayla-Kaè and kneeling son Phillip and airfield dogs Girly and a yet to be named new arrival. 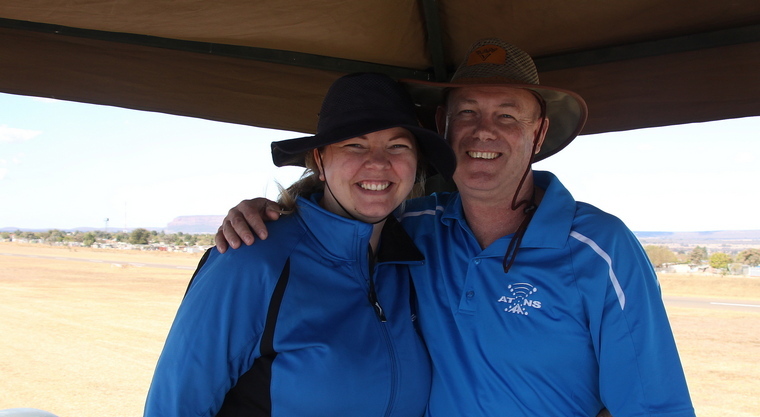 Taildraggers is organised by the Nylstroom Flying Club members and Richard Nicholson whose family, wife Mariette, sons Richard and Phillip and daughter Tayla-Kaè are all involved. 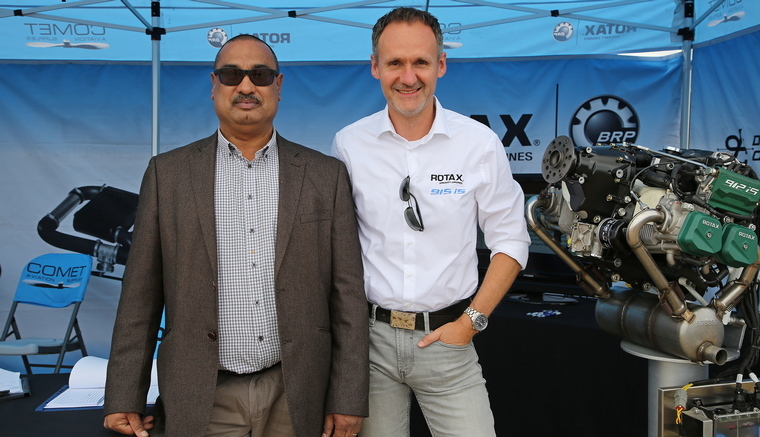 Last year 120 aircraft attended. This year the weather unfortunately did not play ball and 106 aircraft made up of 24 different types attended the event this year. We arrived midday on Friday and by the time the sun went down twenty five aircraft were already parked on the apron. Tents were erected by those who were going to camp at the field. 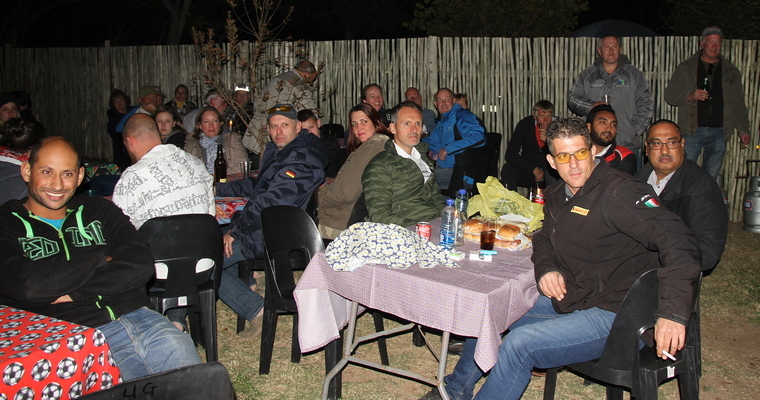 The Lapa looked inviting with fires going and the aroma of hot soup, vetkoek, rolls and refreshments from the bar soon drew the early arrivals for an evening of social banter. 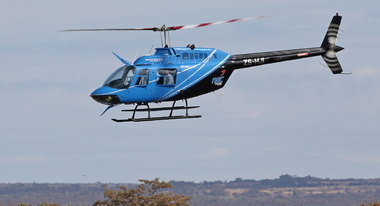 On Saturday morning Sean England and Roanda Steyn whose daytime job it is to marshal airliners into King Shaka Airport in Durban were soon busy in the tower as more and more aircraft arrived. 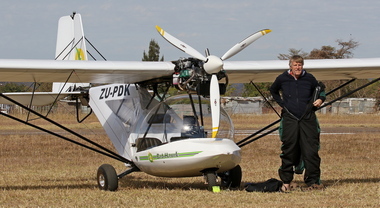 On the ground Safety Officer, Nigel Musgrave kept a close eye upon things and ensured an incident free event except for Archie Kemp who lost the tailwheel of his Cessna 195 when clearing the runway after landing. 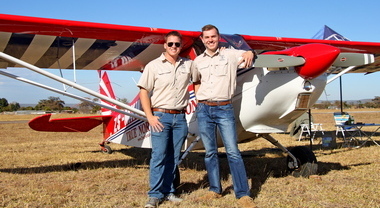 The two Nicholson boys, Richard and Phillip and two friends, Andrew Ishewood and Keaton Howe, all members of the Pretoria Boys High Aeronautical Society acted as marshals. 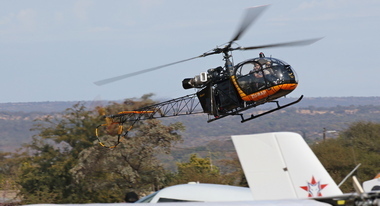 Fuel was available at a very reasonable R18.23 per litre and quite a few visitors made use of this to go on out flights and to explore the pristine beauty of the Bushveld. 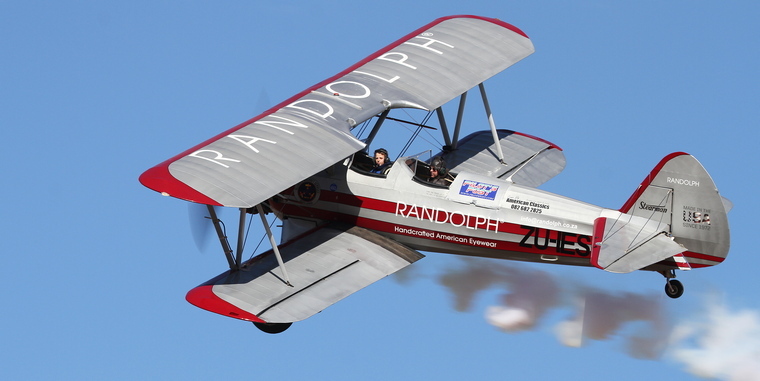 Flipping was the order of the day with especially Ivan van der Schaar in the Stearman and Derick Hopkins in the RV constantly taking off and landing with a grinning passenger onboard. The main topic of the day was what the weather was going to do. 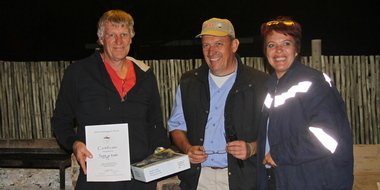 A number of visitors from Gauteng had reported light rain when they had departed and the forecast for Sunday did not bode well and all but a handful decided to leave on Saturday. 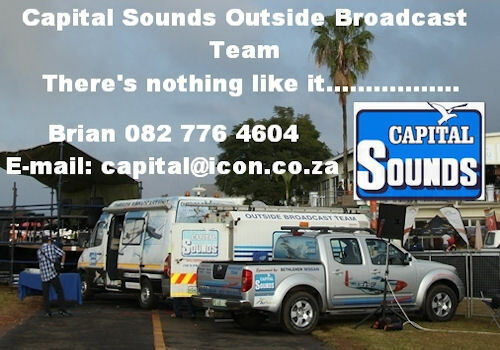 However, the weather at Nylstroom held and there was a lot of action at the field. Aircraft were leaving at regular intervals. 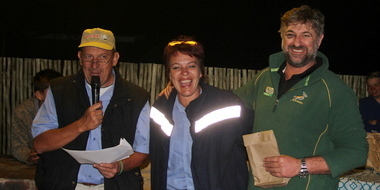 Consequently the Saturday evenings awards dinner, lamb on spit was abandoned and instead braai packs supplemented by side dishes and pap were made available. Music was provided for those that remained and much fun was had by all. 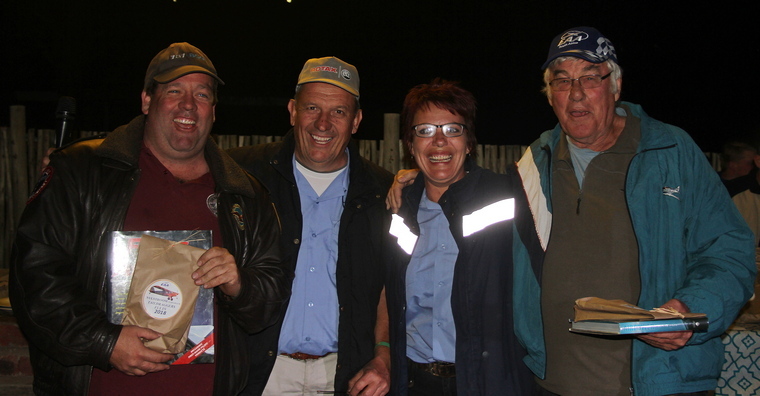 Taildraggers has been consistently good and a growing number of aviators visit every year. If it wasn't for the weather the record of 120 visiting aircraft would without a doubt have been broken. There is much anticipated for the tenth anniversary of Taildraggers. Please make sure that you diarise to attend. Pilot's Post will definitely be there to report.